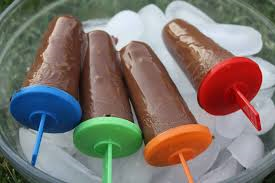 You are here: Blog > General > Beat the Heat with these homemade Fudgicles! We tried this recipe a few weeks ago when temperatures rose to the 90’s in the San Francisco Bay Area (we know it’s usually that hot on the east coast or in the south! ), and we were refreshed immediately. Only tastes good if you use Fair Trade chocolate, cocoa and sugar – no aftertaste of child labor. 1. Break chocolate into pieces and put into a blender. In a saucepan, bring milk (and/or cream), sugar and cocoa to a low boil, then immediately remove from heat. Pour the milk mixture over the chocolate in the blender, add vanilla and salt and let sit for a few minutes until the chocolate is softened. Blend on a low speed until the mix has emulsified and is smooth. 2. Pour the mixture into ice pop molds. Let sit in the freezer for about 1 hour before inserting wooden sticks, if needed. 3. Freeze well for 24 hours. Enjoy!